Cancellations free of charge are possible until 4 days before arrival. In the event of a no show or a cancellation with less than 4 days notice prior to the date of arrival, an amount equivalent to one nights cost of accommodation will be charged. Family run 4-star hotel located in the heart of Tyrol with a magnificent view of the mountains. Innsbruck, the Olympic city and capital of the federal country Tyrol, is at a distance of only 10 km and the Olympic skiing-area Seefeld is 15 km away. The typical Tyrolese hospitality is especially in evidence at the Hotel Tyrolis. Modern comfort, traditional handicraft with love for detail and our heartfelt desire to make you feel at home in our house are the trademarks of our house. At the Hotel Tyrolis the demanding guest definitely comes first. All our 34 rooms are tastefully styled and furnished. All our rooms are equipped with bath or shower, toilet, radio, cable television, direct-dial-telephone, room safe, minibar and hairdryer. For the most part our rooms have a balcony. Enjoy our delicious cuisine in our Restaurant (closed on Mondays). Our offer reaches from Tyrolese specialities to international dishes. Absolutely stunningly beautiful! Great value! Family atmosphere and pleasant staff. Could not have neen better. A bit far from city center but quiet and gorgeous. A beautiful hotel with a beautiful view. It's a little far from town but buses run fairly regularly into Innsbruck. 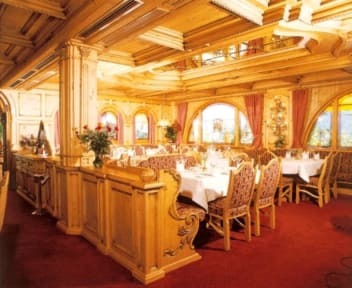 Wonderful hotel with lovely woodwork in the lobby and dining area. Buffet breakfast was the highlight of our stay! The hotel is about 20 minutes bus ride out of Innsbruck and you get to see the beautiful mountains along the way. They provide a guest card upon registration for free bus travel. The only problem we encountered was that some bus drivers had no idea where the hotel, or Zirl, the stop for the hotel, was even though Zirl was clearly showing on the route displayed in front of the bus! A little far out of town but beautiful in the mountains. The room was clean and spacious and such a good break from hosteling. Also really great breakfast. Very accommodating staff for my special needs. A free breakfast that is the best I have encountered in an amazing dining area with lots of custom woodwork, lighting, etc. The only detraction was that my room had a definite tobacco odor. I didn't complain or ask for a change but mildly irritating. The bus to downtown stops very nearby, is 3.60 Euro each way, perhaps 20 min. and very easy. Despite the tobacco smell, I would gladly stay here again. Very nice place to stay. Room is a bit small but it was clean and well maintained. Breakfast was good. Location is bit far away from city itself and not much transportation option. City pass was not valid on the bus goes this route. It will be good to have your own transportation if you choose this place to stay. Otherwise very good. So....I was originally looking for a hotel in Innsbruck but found this in Tyrolis. Very nice hotel, clean. The staff was exceptionally wonderful. The restaurant was great and they gave me all the information I needed or asked for. Very pleased with the service even though the hotel was not in Innsbruck but a town 8 miles away. Cute hotel in a small town in the mountains which is nice for hiking! You need to take a 20 minute bus for Innsbruck, though. The hotel had clean rooms, a nice breakfast and friendly staff. Small and old rooms without air condition and tiny bed; hotel staff was polite but not helpful; breakfast ok.